PELÍCULA CRISTIANA EVANGÉLICA: Hav Faith Hamilton A. Vaughn, un antiguo promotor, más conocido como HAV, experimenta un incidente que le cambia la vida y lo catapulta a la vanguardia de la prominente Iglesia Misionera. Allí se encuentra con un viejo amigo Faith; así como a AJ, hijo del obispo saliente, que no está muy satisfecho con el nombramiento de Hamilton y está decidido a expulsar al nuevo superintendente sin importar los costos. Hav Faith es una narración moderna de la historia de José; donde contra todo pronóstico, obstáculos y malhechores celosos; siempre debemos tener fe en el Dios Altísimo para sacarnos. 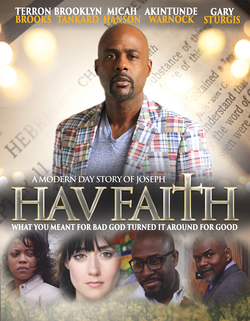 PELÍCULA CRISTIANA EVANGÉLICA EN INGLES; Hav Faith Hamilton A. Vaughn, a former promoter, better known as HAV, experiences a life changing incident that catapults him to the forefront of prominent Mission Church. There he meets an old friend Faith; as well as AJ, son of the retiring Bishop, who is less than pleased with the appointment of Hamilton and is determined to oust the new overseer no matter what the costs. Hav Faith is a modern day telling of the story of Joseph; where against all odds, obstacles and over-zealous evildoers; we should always Hav Faith in the Most High God to bring us out.